“After a long day I love to spend 2-3 hours in the kitchen preparing dinner!” said no one ever. I mean, let’s face it. After a hectic day, cooking is probably the LAST thing you’re looking forward to. You’re ready to come home, hang up your bra, slip on a comfy sweatshirt and crash on the couch with Netflix. Except, you’ve got to eat. Chances are, everyone else in your house needs to eat too. …But there it sits. Instead of preparing a gourmet meal after work, pizza and takeout suddenly sound better and better. You feel guilty about the food in the fridge going to waste, but cooking after a long hard day is simply too daunting and overwhelming. No one feels great when the takeout person recognizes your voice and knows your order before you even give it (this has seriously happened to me before). Some nights, though, “adulting” isn’t in the cards, even if more pizza and takeout isn’t exactly in the budget. Put down the phone! There’s a better way. 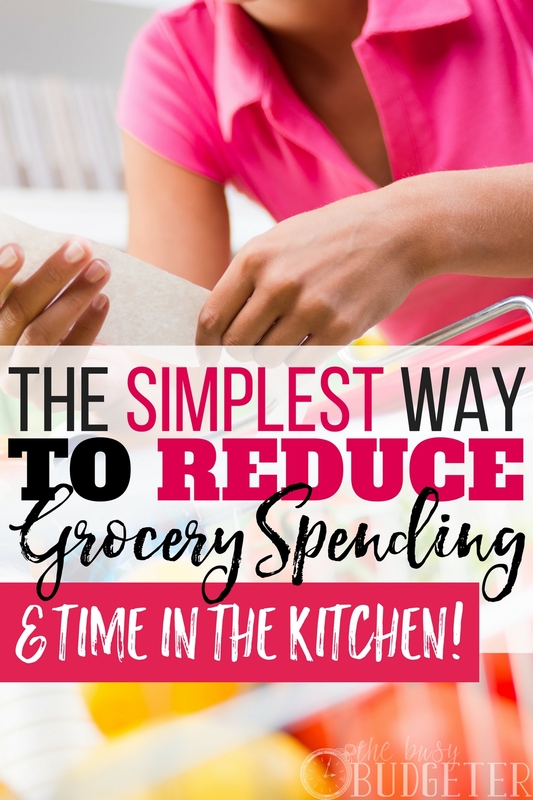 You will reduce grocery spending and your time in the kitchen. I’ll tell you how! So, it sounds counter-intuitive but hear me out. If you want to save money on food, you must limit your shopping trips. You may end up going to the grocery store several times a week to purchase ingredients or pre-made meals. When this happens, inevitably, other stuff ends up in your cart too: a box of cookies here, a few frozen treats there. Soon, you’re spending $40-50 a trip, several nights a week and totally blowing your budget. Yes, buying food in the store’s deli is probably slightly cheaper than fast food or takeout, but let’s be honest, it’s not a huge savings. Not only that, but when you get home you still need to prepare the items, mess up your kitchen and do the dishes. Instead, shop once a week or less. Follow the next steps to reduce grocery spending, so you go in prepared and ready to get EXACTLY what you need and only what you will use. When you get to the store, you’re going to go with a list already prepared. When you shop with a list, be militant about it! Don’t deviate from your list. If you want to reduce grocery spending, I mean, really save money at the grocery store AND spend less time in the kitchen you shouldn’t buy extras or complicated items you really don’t need. Buy only what you’re going to use until your next trip to the store. If an item was accidentally missed on the list, weigh the pros and cons of giving in. If you’re just starting to shop with a list, stay really strict about it for a while (okay, if it’s toilet paper or another mandatory item, make an exception). 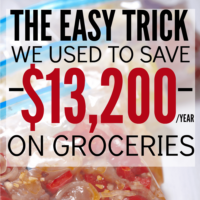 Want to make your life even easier and reduce grocery spending? Automate your grocery shopping. There are a few ways to do this. You can use a grocery delivery service like Peapod or Amazon Fresh. Check with your local store to see if they offer a delivery service or curbside service (many do). You pull up and your groceries are delivered right to your car. Easy! Use a service like Grove for cleaning products. (Grove is fantastic, by the way—they even price-match and everything is delivered right to your door.) I know you might think this sounds way more expensive than shopping on your own, but here’s the deal: your time is important. If you can spend less time at the store and more time working, playing and doing what you love, it offsets the extra cost. The other savings comes by avoiding temptation to throw extras in the cart as you shop. If you find you often walk out of the store spending way more than you planned, automation could SAVE you money. Ready to level up your cooking-at-home game? The biggest secret to saving at the grocery store is to meal plan. Meal planning is going to help you create the list of all the ingredients you need (and eliminate what you don’t). Look for ingredients to do double duty—tonight’s ground beef for tacos becomes tomorrow night’s ground beef for spaghetti. When meal planning aim for dishes with common ingredients or bases you can use several times such as rice or pasta. Don’t forget about breakfasts and lunches in your plan as well. Remember a few snacks too! Having a meal plan ensures you’re easily able to create a list and stick to the list with confidence. You won’t worry you’re forgetting an ingredient. Better yet, you won’t get home with a fridge full of groceries and no idea what to cook and you'll reduce grocery spending. Ready to get out of the kitchen completely during the week (without resorting to the drive-thru every night)? It’s time to give freezer meals a shot! Here’s the deal with freezer cooking. When you first start it may seem a little tough. When I started I loved the fact I was in the kitchen only one day a week. Unfortunately, planning was a little complex and I’ll admit I spent 3, 4 and even 6 hours cooking—on a Saturday?!? Ugh! Then I discovered MyFreezEasy. Guys, can we say TOTAL GAME CHANGER?! This is the plan you need to help you cook ten meals in an hour. Yes, one hour (and I swear, that’s how easy it is, you’re literally in and out of the kitchen in 60 minutes flat). You simply select your meal plan and with the click of a button you’ve got all the ingredient lists, amounts and details. So, now, imagine getting in and out of the kitchen in ONE hour and bam, you’ve prepared 10 meals. For the next two weeks you don’t need to dirty a pot or a pan. You simply heat the meals (most use the crockpot or oven) and you’re ready to eat. Dinner is hot and ready the moment you walk in the door. It. Does. Not. Get. Any. Easier. A few notes on finding maximum success with MyFreezEasy (or any meal plan, honestly): Keep a few memos about your family’s favorite recipes. I always think I’ll remember when a dish was too garlicky or what I added to a recipe when it turned out awesome. You know what? I always forget. You will too. So, write it down! Let go of the idea you need to explore each and every dish, especially if your family is picky. We have one particular eater in our house (my son). Finding food he loves is challenging. So, when I find a hit recipe I write a note, along with any modifications I made. The MyFreezEasy plans are very beginner-friendly. However, if there’s a new recipe you want to use or an unfamiliar ingredient you’d like to experiment with, go easy. Incorporate one new item into your plan each week or every other week. We’ve all had a whim where we’ve purchased an odd ingredient (Tahini? Capers? Miso paste?) because it was called for in ONE recipe that we never ended up making. What happens? The ingredient lingers in the back of the fridge or pantry until finally it gets tossed out. It’s a waste of time, energy and money and we feel guilty, right? Instead, stick with the familiar. Try a different regional dish or exotic combination occasionally. Introduce new ingredients gradually and in small amounts. Don’t buy a case of food you’ve never tried. Buy one. Fortunately, with the MyFreezEasy plan you can read through the recipes to find familiar favorites and discover less-intimidating new dishes to experiment with, helping you to reduce grocery spending . Now, if you really want to save money, time AND avoid fast food, you need a back up plan. Freezer meals are awesome and work super great most of the time. There will come a day though, where you forget to turn on the crock pot, where a meal burns in the oven or a dish doesn’t turn out for one reason or another. Keep a few select back up items in your pantry. These are meals like macaroni and cheese, spaghetti and marinara or a quick stir fry over rice. I always keep Tyson frozen pre-cooked chicken on hand. If worse comes to worse, I know I’ve got a filling protein I can heat up, toss in a wrap or on top of a salad and enjoy. Think of a few fast solutions in case you hit a meal plan fail. Keep these items on hand (add them to your list and store in your pantry) just in case. Don’t forget to build in a few cheater days on your meal planning repertoire too. If you’re not a “cold turkey” type, swearing off fast food completely sets you up for failure. After all, takeout is great as a once-in-awhile treat. You will reduce grocery spending and save a bundle by following these simple tips to organize and automate your meal planning system. Weeknights just got a lot simpler! What are your go-to weeknight dinner solutions? Do you use a meal plan? You speak to me! Ha! I used to LOVE cooking. I’d spend all Sunday prepping for the week, trying and posting new recipes for others to try, etc. Now, it is the last thing I want to do and my husband has took over 75% of it. We are usually good with shopping only once a week, but we need to start making a meal plan, and only buying the groceries needed for it, plus some snacks. I will definitely try out those freezer meals! 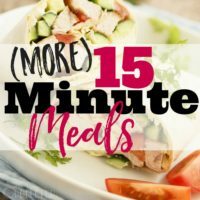 10 meals in one hour?? That is a no brainer here! Love these ideas! We are big fans of meal planning, freezer cooking, and what I call pantry meals. I love having ingredients for super simple meals like cheese quesadillas or flatbread pizzas on hand. I’m pretty good at making a meal plan, but I don’t know how many times I’m on the way home from work and remember I didn’t lay the meal out to thaw! Another issue is feeling bored with the menu plan and eating the same meals each week, so I’m always looking for super simple and easy ideas. Loving your blog posts. I found you through Caitlin Pyle and the Work-at-Home Heroes Summit. I was trained in Caitlin’s proofreading course, so of course I noticed the incorrect date after the word “UPDATE” on this blog post. Please don’t be offended. I guess it’s a gift. I have also learned to use these opportunities to offer support to others. If at any time you are looking for a proofreader for your posts, please let me know. I wish you much success. Agree!! I absolutely meal plan, but I also usually leave one day a week open for an occasional dinner out or an easy, kid favorite meal of soup, grilled cheese and fruit. I’m a huge believer in meal planning, but life happens and having a back up plan as you mentioned is very important. My favorite go-to freezer meal is shredded steak that I save from a previous dinner and use it as a filling for enchiladas or tacos. I always have taco toppings on hand! Yes! 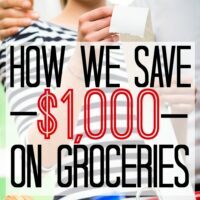 These are great ideas for saving money on groceries! I noticed that I was spending way more on groceries than I should be so I started being more intentional about my grocery purchases and woah, it’s made such a difference. Sticking to your list is key! I don’t really coupon but my local supermarket has online coupons that you can load directly to your loyalty card and I always check them out. Sometimes they lead to huge savings! Thanks for your great idea you have written in this article. Have a back up plan – YES! Man, oh man, did I wish I had read this article about a year sooner. 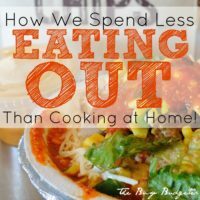 I really dove into meal planning about a year ago and too many times did I have an elaborate dinner (it really wasn’t too elaborate…it was just too many steps for my impatient cooking brain) planned, only to loose all my motivation to make the meal – or like you said, I would forget to turn the crockpot on until like 2pm (I don’t think anyone in my house would appreciate eating at 9pm…woops!). Our back up meal is tacos now. Quick, cheap, and super simple. I always have a few pounds of ground beef on hand now for this reason. 🙂 Great post! Great article. I usually sit down with my recipe box once a week or so and try to devise a menu for the week. Our back up dinner is whatever we happen to find. I’ve never heard of MyFreezEasy but it sounds fantastic. 10 meals in an hour! Count me in! I love to meal plan. One way that I make sure I’m at or under my budget for the week (I only shop once a week) is to log on to my favorite store’s website and put items into my online basket. Then I can see how much (approximately) I’ll spend when I head to the store. If I’m over budget, I can adjust my meals and grocery list as necessary. This alone has saved me a lot of money. I wish my husband would only go grocery shopping once per week….he always says he “forgot something” so then he goes back a few days later. Guess what he comes home with? So much stuff we already have or don’t need! I think our grocery budget would be so much better if I can get him to avoid the grocery store haha. Great suggestions! It takes planning and effort to save money on groceries. You’re totally right! Meal planning, freezer cooking, and having some standby meals are great ways to get meals on the table for less! My backup meals are spaghetti and chicken strips. I always have the ingredients for spaghetti in my pantry and a bag of chicken strips in my freezer. I meal plan the entire month at once otherwise I fall off the meal planning wagon. I try to plan my meal plan around the things I already have in my freezers for that month and shop the sales during the month to plan for the next month. Sometimes that does find us eating a lot of the same meat or veggies but we are used to it and it works and keeps the budget lower. This past weekend I found boneless skinless chicken breast for .99 cents a pound and stocked up (we now have roughly 80 breasts in the deep freeze) the packs had 5 breast each and cost less than $4 a pack. So that was a definite budget win. We are a family of 3 with a college student that lives out of state who we support 100% and when I find a good sale I stock up so my daughter can take food back when she comes (or we go see her) home. It does definitely help to stay out of the store. I used to run in for one item and like you said come out $50 poorer. I had to stop that! I just recently started using the Walmart grocery pick up and it is AMAZING!! I don’t know why I waited so long!! Nothing extra finds its way in to the cart!! It really has cut down my Walmart spending. I taught my daughter how to use this (for her perishables) and she LOVES it also! What a win for the budget there! If I make a meal plan we are guaranteed not to eat any take out! That is definitely a budget buster! Even if it’s something we just dont want to eat we cook it and eat it anyway. Food doesn’t always have to be “fun” it just has to sustain us. That’s what we say on the nights we don’t want what we are having and it works out. No one is going to bed hungry and we are working hard to pay off our debt so it is always a budget win when you are “sustained”. Thanks for sharing those ideas I am going to try to implement them as we continue this “get out of debt” journey! Call kaspersky customer support will offer greater protection for your near and dear ones whenever they use the internet for shopping, surfing, and other activities. There is added security for passwords and important files and documents. You can also safeguard your children from any threats to digital channels.